The science is clear that human activities over the last century have contributed to greenhouse-like warming of the Earth’s surface. Much of the global conversation around climate change fixates on what individual countries or regions are contributing to the problem, and what they will do (or not do) to reverse the tide. But Colorado State University’s A.R. Ravishankara, University Distinguished Professor who holds joint appointments in the departments of chemistry and atmospheric science, says the full picture is longer and more complex than meets the eye. It involves a legacy of past actions, as well as irreversible commitments for the future. Ravishankara and co-author Daniel Murphy of the National Oceanic and Atmospheric Administration offer a new calculation that provides the long view of what nine different world regions have contributed to climate change since 1900. They also show how that breakdown will likely look by 2100 under various emission scenarios. Their study is in Proceedings of the National Academy of Sciences, Dec. 17. They call their calculation “cumulative radiative forcing” because it integrates the ebb and flow of climate factors throughout the past century, rather than just a snapshot of what it is today. “Radiative forcing” is a metric that measures the sun’s energy that is retained by Earth. Global warming is the result of positive radiative forcing, or more energy being retained by Earth than escaping back into space. Their study also underscores the insidious two-sided role of particulate matter pollution in the atmosphere, the result of burning fossil fuels, wildfires, and other human activities that have spewed pollution and dust into the atmosphere over many decades. Such aerosols are short-lived in the atmosphere, but they have a net cooling effect due to their interaction with sunlight and clouds. While carbon dioxide and other greenhouse gases linger in the atmosphere and continue contributing to warming for many years, aerosols dissipate, along with their net cooling effects, more quickly. In total, the presence of aerosols has masked some of the effects of global warming. In their analysis, the researchers found that, for example, between 1910 and 2017, China, Europe and North America each had periods of nearly no net contributions to warming. These periods were characterized by rapid industrialization and growth of GDP, when fossil fuel emissions increased but few air quality controls were enforced. 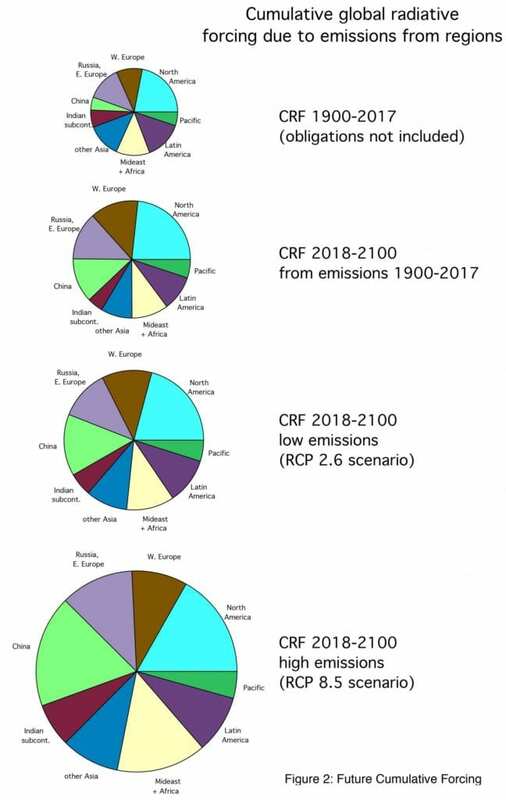 The study further shows that each region’s contribution to radiative forcing due to carbon dioxide (and other greenhouse gases) emissions from 2018 to 2100 will be larger than the total warming contributed during the last century. But as China implements clean air standards moving forward, and the nation’s emissions increase at a slower rate, its share of contributions to climate change will increase, according to the study. North America is the largest contributor now and will remain so even in 2100. The two-sided coin of aerosols – short-lived cooling, but harmful to human health – is starkly illustrated in a separate study authored by CSU postdoctoral researcher Liji David, Ravishankara and other colleagues, to be published online in GeoHealth. The researchers estimate that more than 1 million premature deaths per year in India are due to exposure to “ambient particulate matter” – air pollution in the form of breathable particles like sulfate aerosols, dust and soot. In India, residential energy use – biomass burning in homes for heating and cooking – is the dominant contributor to this premature mortality rate. Of the estimated 1.1 million premature deaths in 2012 from small particulate matter in India, about 60 percent were due to anthropogenic pollutants emitted within the region, according to the study. Yet to date, India’s contribution to climate change has been minimal as shown by Murphy and Ravishankara in PNAS, as it will be even by 2100, compared with other nations. As India implements clean air policies and works to reduce premature deaths from air pollution, its role in climate change may increase due to the aerosols playing less of a role in offsetting climate change, but human health will improve. Ravishankara stresses that people should look at effects of emissions holistically. Future climate scenarios must take into account all warming contributions to date, and the effects of those contributions moving forward. Emissions reductions would not only help climate, but also human health, he says. Aggressively reduced carbon dioxide and other emissions, for the sake of the planet and for the sake of human health, are the only viable options. “We need to ask not only what is our commitment going forward but also what is our legacy?” Ravishankara said.